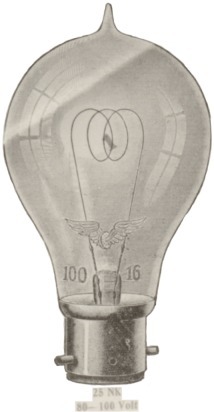 Interestingly this is the only bulb in the set of 7 prints that carries the winged wheel. 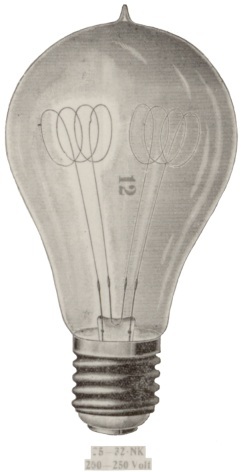 Possibly, as this is bulb number 1, it is marked specially as their first bulb. 4 loop filament. Pipless, note filament support. Dual filament. Bulb inside dark glass? 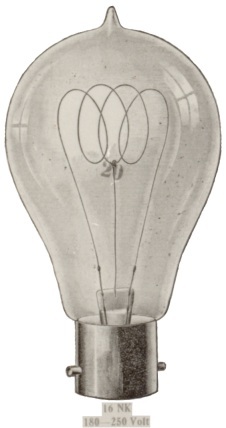 bulb. Two thread base. Internal glass filament support. 3 loop filament. 4 loop filament with centre support. 4 loop filament with 2 side supports.